As newly appointed chair of Economic Development, I look forward to this term with enthusiasm and hope. We have a brand new Strategic Plan, new committee members and lots of great ideas to move our Township forward. Note: Check out our Strategic Plan to see the action items for each area. It will take a lot of dedication, hard work and commitment to see these through to fruition. Together with our dedicated staff and committee, teamwork, partnerships and your help we can realise the goals we have set. 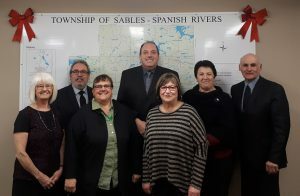 The Township of Sables-Spanish Rivers is conducting a survey to determine interest in establishing a farmers’/fresh air market next summer. We are looking for feedback from local vendors, producers, consumers, local talent and NFP organizations. A copy of our updated Strategic Plan 2018 – 2021 & Strategic Plan Appendix A is available for viewing. Regular Council Meetings are held the second and fourth Wednesday of each month. Meetings commence at 6:00 pm in the Municipal Council Chambers. All Council meetings are open to the public – everyone is welcome to attend! A copy of Council’s Procedural Bylaw (as amended 2019) is available for viewing. Your elected officials are always willing to listen to you – give them a call! Parks & Recreation Committee Meeting - 7:00 pm in the Council Chambers!